Firstly, I apologise for the lack of a post last week. This was due entirely to my laziness and feeling a little miffed at not being able to run. By way of penance, I paid a few quid to WordPress so hopefully you won’t see annoying adverts on the blog any more. I have been managing an assortment of minor left leg injuries and niggles over the last few weeks. By running on alternate days and making sure that I undertook a long warm up before any fast runs, I seemed to be just about getting away with it. In truth, I wasn’t doing anywhere near enough miles nor spending enough time on my feet to be properly prepared for a marathon. This wasn’t because I didn’t want to, it was because I couldn’t. After the National 12 stage relays in Birmingham, I couldn’t run at all without pain. In fact, I felt discomfort even whilst walking. My foot was stiff, my achilles and calf sore and tender and I had twinging pain in the side of my knee and the bottom of the hamstring. I went to see a physio at The Coach House practice in Headingley. He did the usual assessments, watching me walk up and down in just a pair of shorts (me, not him) with some bending and mobility tests. His verdict was “You are totally stuck on you left side” – he said my foot and ankle was stiff and didn’t have much range of movement, as were my hips which meant I was ‘hitching’ and using all the wrong muscles to run. I was told to lay face down on the couch and he gave me a right old battering. He hit quite a few really tight spots, inducing whelps and whimpers of pain from me. “Is this your normal pain threshold?” he asked impassively. How was I supposed to answer that? Was he calling me a wimp or complimenting me on my ability to withstand his aggressive dispensation of therapy? I muttered an incoherent response and buried my face in the pillow, praying for it to end. On the positive side, he didn’t think that I had a serious injury, he just thought my body had rebelled and had gone on strike for a bit. The plan was to let everything settle down, then try some running drills and then short runs if it felt better. I didn’t run much at all for two weeks, save for a couple of tester runs which lasted only a couple of minutes before I realised it was pointless trying to run in pain. I tried to retain some fitness by beasting myself on the Wattbike in the gym at lunchtime and going out on my bike once the weather warmed up (I am a committed and devoted fair-weather cyclist). Yesterday, I went for a run around the wonderfully named Bedquilts sports ground – a huge expanse of grass playing fields in North Leeds. I managed to run laps for a whole hour, building it up from a timid jog to something approaching 7:30 pace. Running in a straight line felt fine, but my ankle didn’t want to make any sudden turns to the left or right. After 40 minutes, my legs were feeling it, but I was pleased to stick it out for the whole hour. I could try running London – with a bank of years of training, I could probably get myself round, but I know that I couldn’t run the whole way. However, I am not going to. Just getting round doesn’t really float my boat I am afraid. It would be painful, I might make the injuries worse and I doubt that I would enjoy it much. A marathon is a serious undertaking that requires the utmost respect. I am nowhere near fit enough to run one. Therefore, I am going to experience the London marathon as a fan and spectator for the first time, support my partner Liz as much as possible and just enjoy a weekend away in the company of people that I really like. I’ll try to get healthy and then work on getting fit for some shorter races later in the year. Liz is running London for the first time in a few years. She hasn’t had an easy build up, but has stuck to her plan diligently (unlike me) and I really hope that she enjoys the marathon. She is raising money for the brilliant Mini Mermaids run by our friend Hannah Corne. Liz has coached many Mini Mermaids programmes over the last few years. You can read Hannah’s amazing blog here. Good luck to all friends who are running London, I’ll give you a cheer if I see you. My late uncle, Norman Smith, was a remarkable man. He was ebullient, naturally comedic and lived life to the full. He dominated any room he was in by cracking jokes, singing or just generally acting the goat. He made and lost a fortune in business. He was a professional sportsman and coach (he played rugby league for Dewsbury and Featherstone and later coached Dewsbury and was coach at Leeds Rhinos). Norman was quite a character. He died just over two years ago after suffering a catastrophic stroke. He was just 69 years old. They had to draft in the police to control the traffic around the Crematorium at his funeral because so many people wanted to be there. Norman’s two daughters are both remarkable and successful in their own right. The eldest, Gemma, has worked with racehorses all her life – she left school and joined the Hammond yard in Middleham as stable staff and has worked her way up to be the assistant trainer. Three years ago, she was named employee of the year at the prestigious Godolphin Stud and Stable staff awards, receiving a prize of £20,000 presented by Sir Tony McCoy and Claire Balding. Gemma has written a best-selling book about her life and career – Stable Lass. It’s an honest and very funny insight into what it is really like to work with racehorses. I thought it was a great read. Norman’s youngest daughter, Becky, also works in racing at the Hammond yard. After her promising career as a hockey player was curbed by injury, she followed Gemma into racing and has become one of the best lady jockeys in the country – riding both on the flat and over the jumps. Last year she was the Champion lady amateur flat jockey in the country. After Norman died, his mates formed a syndicate and bought a racehorse to run in his memory, to be trained by Gemma and ridden by Becky. I can’t imagine that there were many disagreements on what the horse would be called – his nickname “Stormin Norman”. Stormin Norman is only small, but is beautiful with a big white face. Until Wednesday, he had run in three races. He ran well on his debut, but clearly didn’t like the soft ground he encountered on the subsequent runs and finished down the field. Last Wednesday 3rd April, it was two years to the day since the original Norman’s funeral. Stormin Norman was entered to run in the 5.05 at Market Rasen. He wasn’t fancied much – he was 20/1 in the early betting market. Naturally, I backed him. In fact I back every single horse that Becky ever rides, whatever the odds. This time, I had a feeling, so I put on a quite bit more than I usually would. I’m not normally an emotional person, but tears were streaming down my face as Becky rode past the line. What a story. Two years to the day after he was buried, a horse named after him, saddled by his eldest daughter and ridden by his youngest (and carrying the colours he wore when he played rugby and wearing the same number 6 he wore), wins in a brilliant close finish. They could make a film about it. It was my biggest ever win on the horses, but that didn’t matter. Sometimes in life something just perfect happens. After my rather downbeat post last week, I received some nice messages of encouragement. Thank you. My mate Jock sent an e-mail which was basically a stern talking to. He was quite right too – he said that I was racing too hard and too frequently at shorter distances and I wasn’t getting enough recovery to enable me to do my long runs properly. I agree entirely. I haven’t trained for this marathon very intelligently. Last week’s post was entitled “Am I injured or just lazy?”. I can answer that question now – I am definitely injured. I got up at 6:30 a.m. this morning and made my way up to the reservoirs, hoping to complete a final 20 mile long run before London in 3 weeks. The plan was to run 10 miles on my own before meeting up with friends Myra and Sean for the last 10 miles. As soon as I set off everything in the lower part of my left leg felt tight and painful – ankle, achilles and calf. I have become accustomed to mild pain and tightness in my calf over the last few weeks. It usually it eases off sufficiently after a couple of miles to enable me to run reasonably freely. But not this time. I jogged / hobbled / walked around a half lap of 4 miles and then skulked back to the car. 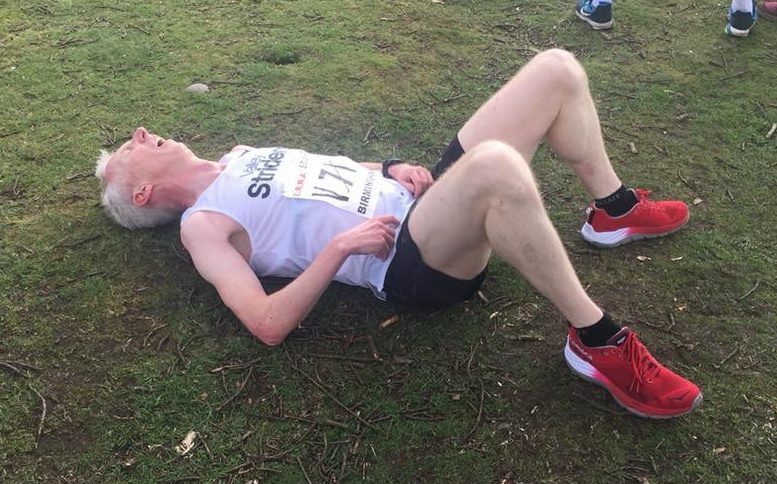 I know why I was knackered – I had run a short leg of the National 12 stage Road Relays at Sutton Park for my club Valley Striders yesterday. Valley Striders qualified for the National Road Relays by finishing in the top 24 at the Northern relays in Birkenhead a few weeks ago. By any measure, I’m not quick enough to make the team if our best runners compete; however many of the fast guys were unavailable and we were struggling to raise a team so naturally I put my hand up. The event comprised alternating long (5.3 mile) and short (3.16 mile) legs. I was second off, running a short leg. The standard was very high – many of the absolute top elite British runners turn out for their clubs including internationals. About 70 teams were competing. So early in the race, the teams were still quite bunched together, so I had the rather dispiriting experience of being passed by many runners during my leg. There wasn’t much I could do about it, I’m a 52 year old 37 minute 10K runner and many of these were skinny-as-a-lat twentysomethings who can run 10K in a smidge outside 30 minutes. Knowing that I had a few niggles, I’d done a nice long warm up and I tried to pace it sensibly. There was no point in bombing off, then breaking down and hobbling round. The course was tough, the first two miles gradually uphill, with a descent for most of the last mile before drag back up to the line. From the final bend, there was maybe 150 metres to the finishing banner. I sensed a Chorlton runner on my shoulder, he was being urged on to beat me by a gaggle of his supporters. I’m nothing if not competitive, so I fired the burners and gave it everything in the final sprint. It nearly killed me, but I was delighted that he didn’t pass me. According to Strava, I was in the top 20 fastest of all for the finishing sprint on the day – out of over 1,000 top runners…I’m pleased about that! I tried my best, but I still lost 9 places during my leg, handing over in 54th position. My team mates did a great job in clawing back all the places I gave up and we finished 45th overall. Our ladies team were 41st in the female 6-stage event. Project London has fallen off the rails. All I can do now is try to recover. I won’t run much at all for the next three weeks. I’ll cross train, try to get some physio and hopefully my injuries will improve. I’ll only start at London if I think that I can run pain-free. Given my disrupted training, I’m not setting any targets. I genuinely have no idea how fast I could run a marathon, but I am pretty certain I couldn’t run one in a sub 3 hour time, so there is little point in stressing about it. We’ve already made all our arrangements – booked trains and hotels, and Liz is on course for her first London in many years, so I’ll be there in some capacity. I hope it will be as a runner, but if I am chief bag carrier and supporter, then that will be great too. Oh dear, its not exactly going to plan. A combination of my age (52), a host of minor niggly injuries (a sore ankle, a tight calf and neural pain in my knee) and a loss of a bit of mojo are afflicting me at the moment. My legs are feeling stiff and painful during the first mile or so of every run. Once I have warmed up my ageing tendons, I seem to be able to run reasonably freely. I heard ex-elite athlete Jon Brown speak at the England Athletics Endurance seminar about 6 weeks ago. Despite twice finishing fourth in the Olympic marathon, his opinion of the event was illuminating. He said, “I hated the marathon, it was so hard and the training was just so tedious”. I think I concur. Like me, he loved running and competing – he wanted to be successful and win medals; but despised his best event. The marathon definitely isn’t my best event – judged on age graded PBs then 5K or 10K is my best distance (about 82-83%). I suspect my true best event is probably even shorter, maybe 800m or even 400m, however I don’t run those competitively (yet). In comparison, my best marathon performances are only around 77-78% on age grading. I’m finding marathon training quite debilitating this year, it feels like a slog, and is slowly breaking me down. London will probably be my last go at the marathon distance. I’m not the sort of runner who just wants to jog around completing the distance. Standing on the start line of any race, I have an overwhelming feeling of wanting to give it my absolute best effort. I ran two all-out 5K races last week (well one was 4.8K in truth), both held at the Brownlee centre cycling track in Leeds. On Wednesday night I ran the second race of the Even Splits monthly 5K series. I gave it everything and I recorded 18:14, which I was satisfied with. I’d just about got over that effort out of my legs when Saturday came around. I was in our ‘A’ team for the four leg Yorkshire road relays. The fact that I was in the A team tells you that we had a bit of a scratch team out (no disrespect to the other guys). We have some very speedy guys in the club at the moment – many of whom can run sub 16:30 for 5K. However, many of our super quick guys weren’t available. The event was 4 legs of 4.8K each around the Brownlee track. I anchored the team and ran a respectable 17:52. It was the slowest leg of the four, but I gave it my best, which is all one can do. I was disappointed in myself for poor racecraft though. By the time I was sent out on my leg, the race was very spread out. I soon conceded a place when a much faster runner caught me and zoomed away, there was not much I could do about that. Halfway around the final lap, I was on his shoulder. I sat behind him for a few hundred metres and was feeling fairly comfortable. I should have just sat in behind him and waited right until the last 50 metres to try to beat him in the sprint. Stupidly, I surged with about 300 metres to go, thinking he was weak. I got a gap of about 5 metres, but my nose was now out in the wind. I couldn’t quite hold the speed and he got on my shoulder and passed me off the crown of the final bend. I had burned all my matches and had nothing left. I’ve no idea if I would have beaten him in the final sprint, but the way I raced the finish was just stupid. I need to get one more proper long run in before London, hopefully that will be next Sunday. I am running on Saturday for Valley Striders in the National 12 stage road relays at Sutton Coldfield, so I expect I will be knackered again. I’m ready for the taper. My niggly calf restricted the mileage again this week. In my ideal World, I would be running between 60 and 70 miles five weeks out from the marathon. However, there is no point pushing it when your body is creaking. As it was pay-day this week, I treated myself to some more new Hoka running shoes. I shamefully admit that I now have 6 pairs on the go. My new ones are Tracers, light in weight and hopefully imbued with speed. I gave them a debut run-out at Woodhouse Moor parkrun yesterday. Back in the day, I was part of the furniture at Woodhouse Moor, I hardly ever missed a week. Ten years ago, there weren’t any alternative parkruns to go to. It was nice to go back and I got a lovely cheery greeting from Anne Akers, one of the great stalwarts of WHM. I also bumped into Tom and Helen Williams, who were instrumental in establishing the event all those years ago. In the early days, I ran around the moor each Saturday morning with fewer than a hundred fellow parkrunners, it was like belonging to a wonderful secret club. The cat is firmly out of the bag now though. Nearly 600 ran yesterday, the course got very congested and it was difficult to really blast around on the final lap. I’m certainly not complaining; parkrun is for everyone. I caught up with an old mate Al Chapman on the start line. Al and I have had many a battle around the moor over the years, usually finishing within a few seconds of each other. I saw that he did a great run at Thirsk last Sunday – running a 10 mile PB of just over 60 minutes, so I knew he was in good nick. I wasn’t feeling hugely confident in either my calf or my form, so I set off a little steadier than I normally do and hoped to build into it. Its a three lap course, and I ran the first mile in 6:03. Al was behind me, but as we passed the finish for the first time he stepped on it and surged past me strongly. I clung onto him during lap 2 (6:06), but the elastic was approaching breaking point as we wove through the field on the final lap (6:05). A sprint at the end brought me back within 4 seconds of Al and I finished in 18:31 for an 80% age grade and ninth place, which I was happy with. Hopefully, I will run a bit quicker than that at the Even Splits 5K race this coming Wednesday evening. Today I joined a group of Valley Strider team mates doing a variety of long runs on the Leeds-Liverpool canal towpath at various paces. I ran with our fastest lady, Myra, who has a marathon in 3 weeks – Ian and Joel ran with us for part of the way.. I stupidly forgot to take any nutrition and I bonked spectacularly after 20 miles, Myra left me trailing in her dust as she sped up and ran some sub 7 minute miles at the end. Still, I did what I had to do – I ran for exactly 3 hours to the second and covered 22 and a half miles. It’s Sunday morning as I type this. In common with most runners, Sunday mornings should not comprise lounging round in your dressing gown drinking aeropress coffee and eating bacon and eggs. No, you should be out running. At this very moment, I should be warming down after running the Thirsk 10 mile race, but instead I am resting after tweaking my calf. I don’t think it is a serious injury, a strain rather than a tear. A few years ago, I may have thought, “ah, she’ll be right” and just gone and run the race anyway. However, six weeks out from my target marathon, that would be pretty stupid. A strain can easily become a tear and then I would be out for a month with no hope of running well in London. On the positive side, my 5K race on Thursday went went. It was at the York Sport Village cycle track – 5 laps of a flat 1K loop. The race was run in two heats – the A race is for sub 21:30 runners starting at 8pm and the B race started at 7:15pm. I drove across with Liz and our friend Hannah. It was a cool and windy night so I presumed a fast time was unlikely. Liz went in the first heat and ran a near perfect race. She dropped into about 10th place and just worked her way through the field with absolutely metronomic pacing – every km was within a couple of seconds. She finishing second behind a guy who by rights should have been in the faster heat. My pacing wasn’t nearly as good as Liz, but it wasn’t disastrous. Although I wore my Garmin, I purposefully did not look at it once during the race. I tried to be ‘in the moment’ and just race my competitors instead. As it was windy, I hoped to run in a group and take some shelter, but as the race settled I got unhitched from a group of about 5 – they were just going that little bit too quick for me, so I ran laps 2,3 and 4 mostly alone. I was flagging a little at the start of lap 4, but my ire was pricked when a competitor passed me on the inside by running on the grass infield (a bit naughty in my book). “Come on mate, keep it real” I said and then surged ahead and cut in front of him in a fit of pique. The little incident spurred me to kick on hard and I finished in a time of 18:29 for 31st place and first in my age category. On a windy night, I was happy with that. I’d given in full beans and delivered my effort fairly evenly, which is all you can really do in a race. The following day, I knew my calf was feeling a bit tight as I was going about my working day. After work, I donned running kit and headed out for a slow recovery plod around the block. After just a few yards, I felt the insidious knot of pain halfway up my calf so I stopped immediately. Hopefully, a few days rest will see me right. I’m feeling tired and slow and I am doubting my abilities. This is the ‘nitty-gritty’ part of marathon training when you prioritise the volume of miles over speed. Running 65 miles in a week has left me feeling knackered and sluggish. There is little time for rest and recovery when you are 52 and grinding out 65 miles. For various reasons, I hadn’t run any races or even a parkrun for three weeks. My RunBritain ranking is slipping alarmingly, so on Saturday morning I wanted to arrest the decline and pep up my spirits by running well at the hilly Roundhay parkrun. I hoped to duck under 19 minutes for the first time in ages. Unfortunately, the weather was spiteful – the cold temperature necessitated three layers and wind and rain whipped over the course. I still gave it full beans, but it felt that I was running with ankle weights on and I could only manage 19:32 and eighth place. Today’s long run was an old fashioned character building outing – a 21 mile tour of north Leeds in rain, wind, hail, sleet and even snow at the end. Thankfully, I had teammates Joel and Myra to run with otherwise I may have jacked in and gone back to bed. I managed to average sub 8 minute miles, even allowing for a 10 minute 21st mile when the sleet was firing directly in my face and I couldn’t be arsed any more. That’s three 20 mile+ long runs logged. The absolute minimum acceptable number is five…hopefully I’ll do more. On the positive side, I’m down at racing racing weight and I have some treats to look forward to next week. A day at Cheltenham races on Wednesday, then a blast around a fast 5K race at the York cycle track on Thursday and one of my favourite races next Sunday – the Thirsk 10 mile race. Hopefully, my handicap may start moving other way soon. This week’s post is all a bit negative, so to lighten it up a little try a light-hearted quiz…Can you name some famous people you might you find in the garden?…the title is my starter for ten, there’s also Sophie-Trellis Bexter and The ‘Hedge’ from U2…comment if you can be bothered! There was a lot of discussion at the England Athletics Endurance Coaching get together last Sunday about the benefits of training at altitude. After a much experimentation, EA coaches came to a consensus that around 1400 metres is the Goldilocks height for endurance runners. Only a short report this week kids as I am about to fly off for a few days skiing, so there won’t be much running next week. The clear highlight of the week was taking part in my first ever English National Cross Country Championships, staged for the first time on the beautiful Harewood Estate just North of Leeds. It was a magic early spring day of warmth and hazy blue skies. Harewood is often patrolled by a large wake of Red Kites (yes I had to look that up). They must have been befuddled by the mass of coffee and burger vans, skinny humans and the booming public address. It was quite a spectacle and I hope that the southerners were duly impressed. For me it was a day of schoolboy howlers and a rather mediocre race. My first error was my shoe choice. I haven’t worn spikes in a race for over a year. I had warmed up in my old yellow puma spikes before the Northern cross country champs back in January, but decided they didn’t fit me so I ran in trail shoes that day. I donated the spikes to one of my team mates. To make sure I was happy with them I did a slow mile and half jog around the football pitches in the gloom after work. They felt OK so I resolved to run in them on Saturday. Massive mistake number two was revealed after we had arrived at the club tent prior to the race. That morning, I had pulled out my club vest from the wardrobe and tossed into my Morrison’s bag for life, together with my other race kit. I carefully pinned on my number, but as I pulled the vest over my head and down my chest I struggled to force it past my nips…what the f? Oh dear, I had brought one of Liz’s vests by mistake. She is a petite lady whereas I am a lanky bloke. I could just about force the vest down past my belly button, but I could barely move my arms! What a complete plonker I am sometimes. There was no way I could run in it. Fortunately for me, I had brought a Valley Striders club T-shirt which just about matched our club racing vest colour scheme. I thought I had better check that my kit would pass muster, so I found the race referee and asked for approval. After she had stopped laughing, she said “yes, no problem”. After watching our ladies set off in their race, I warmed up with a few team mates and then just before three o’clock we made our way into our allotted start pens. The men’s start at the National is something to behold. The start line must have been nearly a hundred metres wide and after the gun went over two thousand men all sprinted up the opening hill to make the first left hand turn after about 400 metres. It truly was like a scene from a medieval battlefield. I decided to chance my arm and go out as hard as I could. I knew that space would be at a premium for the first couple of miles so I hoped to establish a position in the field and then defend it. Although I charged up the hill for all I was worth, I still came to a virtual standstill at a couple of early pinch points and I had to be quick with my elbows a couple of times as guys tried to take a few liberties and tried to cut me up. Even with the argy-bargy, I still covered the first slightly uphill mile in 6:20. I was blowing hard and my heart rate as 159 – which I knew was too high and definitely not sustainable. I calmed down a little and tried to get into a rhythm. The second mile included a long draggy climb up to the Wike road gate. The gradient meant that I slowed a lot – down to a 7:04 mile. I was giving up a few places, but not too many. The third mile was fast – flat along the top of the ridge then a quick descent, which I freewheeled, passing plenty of runners. My watch flashed up a 6:04 mile split. Mile 4 was tough, a short descent before a nasty switchback to take us back up the hill, then a drop down into the start /finish area before climbing up for the start of the second and final lap. Running up the hill, I realised that my calves were killing me, running in my new spikes had been a very stupid idea. Because I had run quite aggressively, I think I had been right up on my toes (as you should be in spikes), but I was recruiting completely different muscles to ones that I normally used for running when training in my big squishy Hoka road shoes. The second lap was just a long sulk really. I was annoyed at myself for making such a basic error, my mood didn’t improve when I was passed by an old bloke wearing Hoka road shoes! I’m ashamed to say I switched off a bit going up the long hill the second time, the gradient made my calves feel even worse. I managed to get it going a bit on the flat section at the far end of the estate but I was struggling again on the final hill, I was passed by lots of runners and the worst of it is, I didn’t really care that much. I barely even raised much of a sprint in the long finishing chute. So, all in all, a pretty inauspicious effort in my first National. My final time was 49:35 which got me 996th place out of 2008 finishers, so I just scraped a top half position. The Valley Striders men’s team did really well, finishing in 26th. The ladies were 40th – all in all great results for our little club. After the race I was fairly disgusted with my effort, but when I checked Strava, I saw my average pace had been 6:44, which isn’t that bad – to be fair the course was very firm and fast. I subscribe to Strava premium, which gives a feedback comment based on the data from each run data (heart rate / speed etc). The verdict on my run was “168 Massive Relative Effort”. Maybe I was really trying, but it’s hard to get excited as you get passed by dozens and dozens of competitors. I think I am just a crap cross country runner, but that’s OK, it was still great to be part of such a massive event. On Sunday, I was lucky enough to attend the England Athletics National Endurance get together held at a hotel in North Leeds. I was a full day of listening to insights from elite athletes who competed from 800 metres right up to marathon together with many top coaches. My head is spinning with ideas and I could write reams right now. However, I am going to go and pack for my ski trip. I’ll think I may as well pack my spikes away for a very long time too. The weather has been ideal for running for most of the week – cool and spring-like and a couple of runs were done in just shorts and t-shirt. It was a step-down week for mileage after the heavy one last week. I didn’t have any races, though I fancied running hard at parkrun on Saturday morning. We tried Brighouse parkrun for the first time, so we could meet up with one of Liz’s friends for coffee after. Its a pleasant flat three-lapper, primarily on stony paths around a small park. Despite giving it some beans I didn’t have much speed in the legs and I was a bit disappointed with my time of 18:55. It didn’t help that I was unfamiliar with the course and it was one of those runs where I just happened to be almost completely alone for the majority of the run. It always helps if you someone to chase. Today we headed back up to the reservoirs for our Sunday long run. I originally intended to run 22 miles, and I felt brilliant for the first two hours, banging out 16 miles at just over 7:30 pace. I then bonked spectacularly and limped the last three miles at around 9 minutes per mile. With my groin muscle feeling tight, I decided to sack it off. A couple of things have caused me to think back this week. On Tuesday evening, I was lucky to see my favourite comedian again – the hilarious David o’Doherty at the beautiful City Varieties theatre in Leeds. Four years ago, I saw the Do’D in Manchester. I was extremely single back then and David made an attempt to assuage my lonesomeness by asking me to be his valentine. This morning I completed my first 20 mile+ long run of the training block around the Fewston and Swinsty reservoirs. My legs were heavy and tired after a high mileage week and a hard effort at parkrun the previous day. Despite a lack of speed, it felt great to be out. It was one of those near perfect running days – a little chilly, but breathless with a watery low winter sunshine. For a couple of brief moments, I think I even detected a vague hint of warmth in the sunshine. Spring is not here yet, but it is thinking about getting its suitcase out of the attic. Two years ago, I did a similar reservoir long run with some Valley Striders pals including Liz. Fortunately for me, she accepted my nervous invitation to pop around to mine that afternoon to watch “The Barkley Marathons”. Thankfully, I am single no more and no longer in need of valentines from middle-aged bearded Irishmen. I have been blessed by a remarkable sequence of luck in the past fortnight. Amazingly, I won a new laptop in the Old Leos rugby club raffle (my running club is based there). On Friday night, I won another raffle at a rugby club – a bottle of champagne at a charity quiz held at Sale rugby club. To round off a pretty fab evening our team, the Loser’s Club, won the quiz. We stayed over at our friend’s house in Sale, so we decided to run South Manchester parkrun in Fallowfield. It’s a cracking one-lapper held at Platt Field’s just a couple of hundred yards from my old student house. One of these pictures was taken in 1987 and one in 2019 can you guess which is which? I was up for having a right good go for a decent time, but conditions were against that with a brutal wind sweeping across the course. (Although it was as windy as chuff I was surprised that it qualified as a named storm – Erik). I set off aggressively and was struggling quite badly at halfway into the block headwind. With around a half mile to go, on a cinder path before the final 250m section to the finish around a boating lake, I could sense another runner, a young lad, sitting right on my shoulder. He was no doubt lurking and looking to take the old man in the sprint. I am nothing if not slightly competitive so as we hit the asphalt, I fired the rockets and sprinted for all I was worth. I should have run the final Peco cross country race this morning, but I really wanted to get my 20+ done – opportunities to fit in enough proper long runs are limited. Valley Striders always have a strong turn out at the Peco events and given that my legs were shot, it is highly unlikely that I would have counted for the team. My long run of 20.6 miles took me nearly three hours, i.e. very slow, but it was on tired legs and was more about time on my feet than pace. I’ve run 293 miles so far in 2019. If I can stay fit, that should be good base to build on.